CELEBRATE 6 DECADES OF THE KING OF ROCK & ROLL'S 1960 COMEBACK SMASH! As 1960 was beginning a new decade and Elvis was finishing his time in the armed services, Elvis returned to the studios of RCA Nashville and would go on to record his first comeback dynamic rock and roll classic "Elvis Is Back !" The amazing album featured a dozen of his most rock & rhythm and blues workouts ever captured on wax like the hits "Such A Night" and more rockin’ fare such as "Reconsider Baby" "The Girl Next Door Went A Walkin’ " and of course the definitive classic interpretation of " Fever." The Lp soon went on to achieve gold status and become one of his most important titles in his huge arsenal of masterful albums. Friday Music is very proud and honored to announce the limited Anniversary Edition 180 Gram Audiophile Vinyl release of the RCA Victor classic "Elvis Is Back!" by Elvis Presley. Mastered impeccably by Joe Reagoso & manufactured for a very limited time at R.T.I. on translucent blue vinyl, this will be a much anticipated audiophile dream release for Elvis fans everywhere! Elvis Aaron Presley was born during the Great Depression into a poor family in Mississippi. They moved to Memphis during the early fifties, and as a struggling young truck driver, Elvis cut some demos as a gift for his beloved mother Gladys. The folks at RCA Victor knew that this young fellow named Elvis was destined for super stardom. They quickly signed the legend to a long-term deal forever etching “The King Of Rock And Roll” trademark to his name. He would eventually become the most successful solo artist of all time! 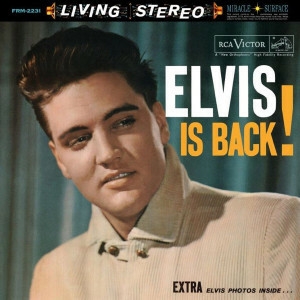 As 1960 was beginning a new decade and Elvis was finishing his time in the armed services, Elvis returned to the studios of RCA Nashville and would go on to record his first comeback dynamic rock and roll classic Elvis Is Back! Ever proving that he was indeed on top of his game, the amazing album featured a dozen of his most rock & rhythm and blues workouts ever captured on wax like the hits Such A Night and more rockin’ fare such as Reconsider Baby, The Girl Next Door Went A Walkin’ and of course the definitive classic interpretation of Fever. The Lp soon went on to achieve gold status and become one of his most important titles in his huge arsenal of masterful albums. In honor of the Man, the Music, the Legend, the King Of Rock And Roll, Friday Music is very proud and honored to announce the limited Anniversary Edition 180 Gram Audiophile Vinyl release of the RCA Victor classic Elvis Is Back! by Elvis Presley. As another stellar installment in our exciting Elvis Presley/Friday Music 180 Gram Audiophile Vinyl Series, we are pleased to present this masterwork in all its 1960 stereophonic glory. Mastered impeccably by Joe Reagoso at Friday Music Studios and manufactured for a very limited time at R.T.I. on translucent blue vinyl, Elvis Is Back! will be a much anticipated audiophile dream release for Elvis fans everywhere! For a limited time only, we are also including a the rarely seen original gatefold artwork presentation including the original 1960 artwork elements, truly enhancing your Elvis Presley listening hours.